Eyes are the window to the soul, and one of the most frequently used organ in human. As technology evolved over the years, human eyes have been constantly exposed to light, pressure, free radical and other environmental factors, causing damages to the eyes and eventually lead to eye diseases. 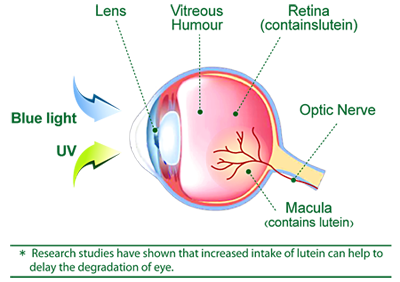 Lutein is found predominantly in the macular region of retina, and its main function is to keep the eyes safe from oxidative stress and the high-energy photons of blue light and ultraviolet light, protecting eyesight from retina damage. 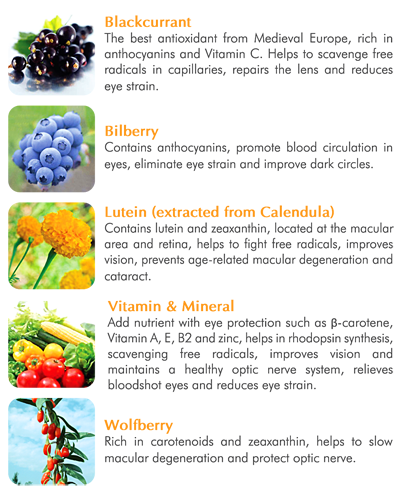 Aging and environmental factors will lead to lutein loss. As our body unable to synthesize lutein, it must be consumed from food or supplements intake. A blend of eastern and western natural extracts, it maintains clear and comfortable vision! No more pills to swallow, Ino White jelly could be your favorite snack! Compact packaging for immediate consumption and enjoyment at anytime, anywhere. Consume a pack a day, before meal. Best served chilled.